By working within networks such as the Promethean League , the Anti-Bolshevik Bloc of Nations  and other intelligence-connected networks, the “Bandera” have successfully commandeered the ideological, political and journalistic attitudes and policies pursued by the countries that hosted them. Fol­low­ing the anti-Russian “lus­tra­tion” laws , Petro Poroshenko is moving to alter the cit­i­zen­ship laws to allow select for­eign­ers to get fast-tracked cit­i­zen­ship in order to allow them to hold cab­i­net posi­tions. It sounds like he’s also con­sid­er­ing just allow­ing for­eign­ers to fill those posts with­out the cit­i­zen­ship require­ment. It sounds as if he wishes to install personnel from the OUN/B diaspora in Ukraine’s law enforcement and national security apparatus. This would be achieved by helping these nations to develop along strong ultra nationalist lines. All the Promethean countries agreed to put any disputes behind them and work together until they were all free ultra nationalist states. 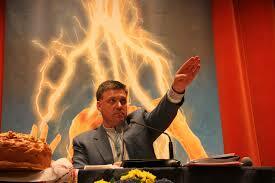 For Ukraine from its inception as a recognized people in 1848, Nazism is the only form of government it has ever known. The short lived governments that followed and continued in exile all these years were known for their unrelenting  brutality and extreme ultra national characteristics. The government of West Ukraine (Galicia) and Ukraine formed a loose mainly symbolic union based on ultra nationalism. Each had its own national government, army, and laws. Simon Petliura  was one of the original leaders of the Hapsburg countries to sign onto Prometheanism. But even as the recognized dictator of Ukraine he was forced to move the government into exile.The only acceptable form of government to a Ukrainian is the Galician (West Ukraine) model of extreme ultra-nationalism. Petliura is revered as a hero in Western Ukraine and a butcher everywhere else for his pogroms, torture, and murder. Following the WWI breakup of the Austria-Hungary Empire the Bandera were an ideal fit. The Germans were the sister empire to their own and they expected the same kind of treatment. That fact made it natural for the Bandera to swear allegeance to the Third Reich forever . It was a slap in the face when they didn’t get the same rights they had under the Empire. This fact, coupled with Hitler losing the war are the only reasons they hate being called Nazis today. Anyone who has followed Ukraine at all is well aware of Bandera’s activities in WWII. The genocide of over 500,000 people in Ukraine , the SS Divisions that the ultra nationalists manned, fighting against both the Soviet Union and the Western Allies. The Bandera SS Divisions also manned the concentration camps that became extermination camps during the war. The Bandera have never stood trial for crimes against humanity, and never even had to apologize. When Symon Petliura (president of the government in exile) was assassinated in 1926, Andrii Livytsky took over. In 1945 Livytsky reactivated the Government-in-exile of the Ukrainian National Republic  and invited representatives of the new emigration to join it. In 1946 he instructed Isaak Mazepa to unite all political parties around the state center of the UNR, and that union eventually resulted in the organization of the Ukrainian National Council  (1947). Because Nazism wasn’t taught in school beyond the fact that it is evil, what Ukrainian ultra nationalism is was forgotten. Most survivors of the atrocities just did not talk about it. Thus, in the 1990’s, ultra nationalism could emerge  and remain unrecognized in plain sight, growing into the organizational force behind the Orange Revolution and the Coup in 2014. All the pro-coup forces present in 2014 including Tryzub/ Pravy Sektor were active in 1991. In the late 1940’s and into the 50’s cold war fever  spread across Europe. Governments began their move to the right and eventually far right, culminating in the UK with Prime Minister Margaret Thatcher. Communist sympathizers in government were ferreted out. Anti- Communist groups such as the ABN became the go to networks for intelligence and sabotage efforts. During the 50’s, Stetsko’s ABN absorbed or destroyed every other group or network not previously aligned with it, and became the sole provider of intelligence to all of Europe’s intel agencies and governments regarding the Soviet threat. These were the only Eastern European government structures that Europe ever dealt with for over 50 years. The Hapsburg monarchy helped guide the leadership in their former possessions. The Freedom Council was formed by Otto von Hapsburg and Yaroslav Stetsko at a conference in Munich  on June 30-July 2 1967, as a coordinating body for organizations fighting communism in Europe . The EFC further institutionalized and legitimized the ABN groups under Stetsko. All of the anti-communist working groups  in every country were tied directly into the respective intelligence services and foreign policy dealing with the Soviet Union. This enhanced their standing and made their support part of national policy across Europe. Brian Crozier  and the Institute for the Study of Conflict (ISC) brought the influence Stetsko’s ABN groups had in the UK to a peak under Margaret Thatcher. When you look honestly at the fruit of the Hapsburg Spring of Nations, Prometheanism , and the European  and US supported Bandera, its really staggering. Ukraine is only in the spotlight because it was the only place where regime change could come quickly. Many of the East European countries in the EU and NATO are already Nazi, or are implementing the political groundwork for the establishment of ultra national governance. Galicia (West Ukraine), Ruthenia ( West Ukraine), Estonia , Poland , Latvia , Lithuania , Austria, Hungary , Post WW I Germany, Bosnia , Hercegovina , Serbia Croatia , Slovenia  and Romania  stepped into this model. The problem with these examples is that they are not cultural exceptions, but the rule. In 2007  at Tbilisi, Georgia, a statue of Prometheus was dedicated by Georgian President Mikheil Saakashvili and Polish President Lech Kaczynski. Saakashvili has shown by his militant support for Nazi Kiev that he is a true believer in Prometheamism’s ultra nationalism. 3. Fol­low­ing the anti-Russian “lus­tra­tion” laws , Petro Poroshenko is moving to alter the cit­i­zen­ship laws to allow select for­eign­ers to get fast-tracked cit­i­zen­ship in order to allow them to hold cab­i­net posi­tions. It sounds like he’s also con­sid­er­ing just allow­ing for­eign­ers to fill those posts with­out the cit­i­zen­ship require­ment. It sounds as if he wishes to install personnel from the OUN/B diaspora in Ukraine’s law enforcement and national security apparatus. Jaresco served as pres­i­dent and chief exec­u­tive offi­cer of West­ern NIS Enter­prise Fund (WNISEF), which was cre­ated by the U.S. Agency for Inter­na­tional Devel­op­ment (U.S. AID) with $150 mil­lion to spur busi­ness activ­ity in Ukraine. She also was cofounder and man­ag­ing part­ner of Hori­zon Cap­i­tal which man­aged WNISEF’s invest­ments at a rate of 2 to 2.5 per­cent of com­mit­ted cap­i­tal, fees exceed­ing $1 mil­lion in recent years, accord­ing to WNISEF’s 2012 annual report . The growth of that insider deal­ing at the U.S.-taxpayer-funded WNISEF is fur­ther under­scored by the num­ber of para­graphs com­mit­ted to list­ing the “related party trans­ac­tions,” i.e., poten­tial con­flicts of inter­est, between an early annual report from 2003 and the one a decade later.